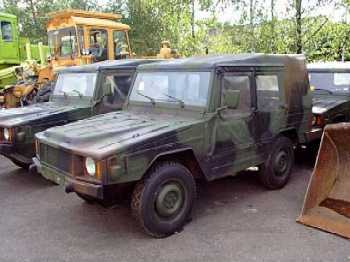 Between 1986-1988 the German Army acquired its Iltis replacements from Bombardier. These were fitted with 1.6-l. 70-hp. turbo diesel VW engines. The one shown left is in the standard Bundeswehr Bronzegrün (bronze green)- Teerschwarz (tar black) - Lederbraun (leather brown) Fleckenplan or camouflage scheme. 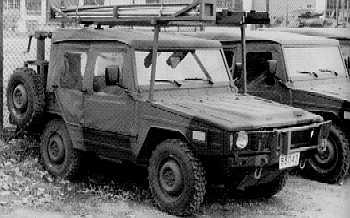 A Canadian-manufactured Bombardier Iltis, here as a Signals Line Vehicle. The Canadian DND web site features a good selection of Iltis photos. Shown below are some of them, linked directly from the 'Photos' section on that site. Road test of Iltis in mud and snow. Iltis vehicle for medical use. Iltis vehicle in field camouflage. Road move planning during 1998 Quebec ice-storm. Troops with Iltis vehicles on UN duty in Croatia. Iltis vehicle in Cyprus in 1990.